This summer, diners in Morristown, NJ will have a new and exciting neighborhood gathering spot: The OFFICE Tavern Grill. The restaurant, which will offer a new generation of American pub and bar fare, has just completed renovations. It now features an open kitchen, which gives you a firsthand look at how dishes are created. Special attention is also paid to the drinks served at The OFFICE. Beverage manager Russell Zimmerman has 40 rotating taps, which feature exclusive beers from local, regional and international breweries. If you like discovering new drinks, you’ll love The OFFICE’s hard cider tap, which is designed to create original infusions and seasonal cocktails. Plus, a Prosecco tap dispenses the popular Italian sparkling white wine. Kids will enjoy the draft root beer served in family-friendly mason jars. If you prefer a mainstream beer instead of craft, The OFFICE has that covered, too. “Our goal is to create a unique and memorable experience for each of our guests,” says Kathleen Janssen, 40NORTH marketing manager. 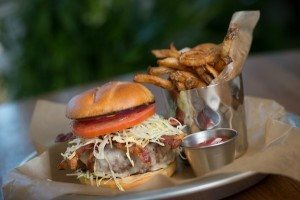 Whether you’re stopping in for a craft beer, a night out with the family or a casual party with your friends, The OFFICE Tavern Grill won’t disappoint. Look for it at 3 South St. (on The Green) in Morristown, NJ.